Cloth diapers may seem like something you only need to check the size of before buying, but if you actually set out to buy some, you’ll realise that the process of selecting one can be slightly harder than you’d expect. There are multiple styles and various brands on the market, and you need to keep a lot of things in mind in order to make an informed decision. In this article we will discuss how you can choose the best cloth diapers, so you can know whether it’s Bumberry, babysoft, superbottoms, or some other brand that’s right for you. 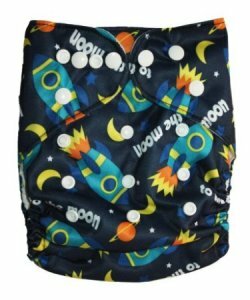 We will also include a list of the top 10 best cloth diapers you can buy online in India to make it a bit easier for you to choose. You might be surprised after going through this section as you’ll realise how many differences there are between each type. 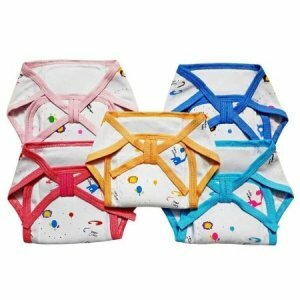 There are many different types of cloth diapers available on the market and it can be hard to tell what makes each type unique. Let us explain what makes each of these types special, and which type we recommend for which age group. As the name suggests, they’re “pre-folded,” so you don’t need to worry about the number of layers while you’re folding it. These are usually made of cotton or muslin, therefore, even though they’re pretty cheap, they do not cause any allergic reactions to the baby’s sensitive skin. These tend to be plain looking, but they do last for a very long time if taken care of properly. Since the size can be adjusted as per the need, they can be used for quite long, regardless of how old your infant is. You would need something to tie these with though as they lack any buttons, strings, or Velcro. This style is already cut into the right shape, so all you need to do is tie the strings. It’s just one layer, so while it is really comfortable and breathable, it isn’t the most absorbent. These types are quite affordable as they’re not too difficult to make, and they come in a variety of cute designs. They are usually made of cotton, so they are pretty long lasting, and they do not cause any allergic reactions either if the baby has sensitive skin. These are great for newborns as you need to change their diapers a lot, but you must also be careful that the nappies are breathable and safe for them. These are the highest level of cloth diapers available in India. They have an outer shell which acts as a cover as it is waterproof to prevent any leaks, and it comes with absorbent inserts that are placed inside to act as the main diapers. The outer shells are usually made of synthetic fabrics, while the inserts can be made of cotton, fleece, bamboo fibre, and hemp. Since these styles offer the most protection, they also tend to be quite expensive. These are perfect for when the baby starts consuming solids and you need to change their diapers less often, which is usually after 6 months. They’re also easier to use for infants who’ve begun crawling and need something that won’t slip easily. 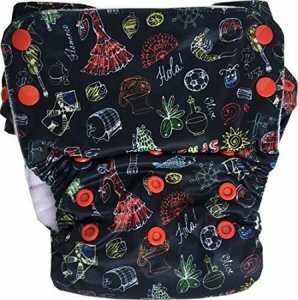 All-in-One or AIO styles are like the upgraded versions of the pocket-type cloth diapers; they already have an absorbent insert sewed into the diaper, so all you need to do is get the baby in them and close the buttons. The insides are made of various fabrics including cotton, fleece, and synthetic fibres, while the outside is usually PUL. Just like the pocket-types, these have a waterproof layer on the outside, so you don’t need to worry about leaks. Since they’re more convenient to use than the rest, they tend to be more expensive as well. They are recommended for infants over 3 to 4 kgs, who you might want hassle-free changing when you’re out and about. Now that you know what makes each type different, let us now reveal our picks for the top 10 best cloth diapers you can buy online in India. We hope you’ll find something to fit your needs. Those who are preparing for a newborn and need single-layer nappies for the first week, when the baby’s skin is still really sensitive, should opt for this product. It is made of cotton, which makes it really soft, and helps prevent rashes. It is also easy to wash, and it doesn’t take too long to dry either, so you can wash and change multiple times. While it does have a padding in the middle, it is not the most absorbent nappy on the market, and this is despite the hefty price tag. Furthermore, as you would expect, it is not leakproof either, so we would suggest keeping these for at-home use only, and using something leakproof for when you’re out. 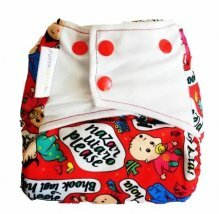 This mid-range pocket-type diaper is for babies over 3 kgs, to keep them dry for about 2 hours. The inner fabric is made of suede, and the inserts are made of microfibre, so it feels very soft against the baby’s skin and doesn’t cause any rashes. It is easy to wash the diaper, as well as the insert, so you needn’t worry about any stains either. It does come with another insert, but even when both the inserts are used, it doesn’t hold for more than 3 hours. Therefore, it’s better to use this diaper at home as well, because if you do not change it after 2 to 3 hours, it will start leaking. It is also a good idea to reserve this for daytime use only, as it wouldn’t hold up well during the night. 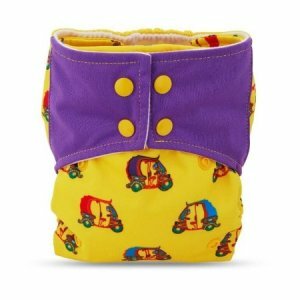 Those who need a pocket diaper for babies over 3 kgs, to keep them dry for at least 2.5 hours to 4 hours, then this is the one for you. This would be great for daytime use when the baby is playing and does not want to be disturbed for a while. 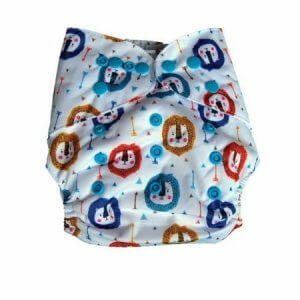 Moreover, it is also one of the most affordable pocket-type diapers on the market. Despite the waterproof cover though, these diapers are only leakproof when the baby is upright, and not when the baby is lying down. Therefore, we do not advise using this diaper for when the baby is sleeping. The inserts are also not the most absorbent, so even if you use both of them, they’ll still leak after 4 hours. This pocket-type diaper is to keep heavy wetters dry for almost 3 hours. It has really absorbent inserts and waterproof outer layer, so even if the baby is a heavy wetter, the diaper will not leak for at least 3 hours. The insert and the inner fabric of the diaper are both really soft as well, so you need not worry about any rashes either. Although, it is one of the most expensive pocket-type diapers on the market, so if you’re on a budget, we would recommend you to choose one of the other products on the list. Additionally, the insert takes really long to dry and doesn’t dry completely without sunlight, so you would have to buy quite a few inserts to keep using it regularly. 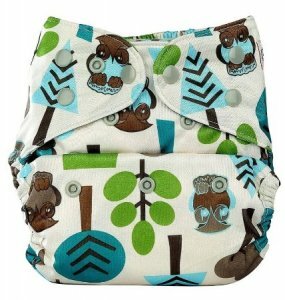 If you need a mid-range pocket-type diaper for a baby over 6 months, to keep even heavy wetters dry for at least 2 hours, then this is the one for you. It is really soft, easy to clean, and a great daytime option as normally it holds for almost 4 hours. 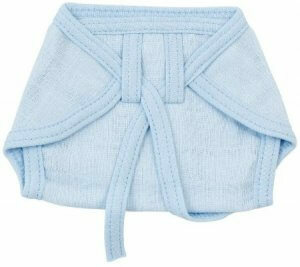 It is quite thick, so we recommend using it in winter, to keep the baby both dry, as well as warm. It is not the most leakproof option out there though, so if that is your priority, then you should choose one of the other products on the list. Aside from the occasional leaks, due to its thickness, it’s also quite heavy, and while that wouldn’t be a problem in winter, it could become a hassle during summer, so you should keep that in mind. These single-layer cotton nappies are better than most other types of nappies as they’re not only padded in the middle, but that actually helps make them slightly more absorbent. The cotton is really soft, and no matter how many times you wash these, they remain just as soft. They’re also one of the most affordable nappies you’ll find. Although, just like all other single-layer nappies, these are limited to newborns, and are not for older infants. You will also need to wash these immediately if they’re soiled or the stains won’t go. Additionally, if you’re particular about the colours, then you should be careful as the colours you get might not be the same as shown in the images. The only prefold-type diapers on the list, these are made with 100% Indian cotton, and it’s not bleached cotton, so you don’t need to worry about any chemicals either. 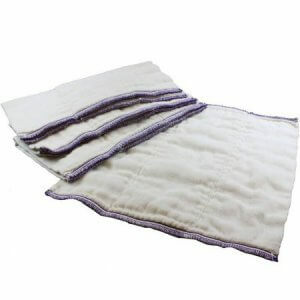 It is really soft and absorbent; it works well for about 4 hours even for heavy wetters, and the softness stays even after they’ve been washed several times. You must keep in mind though that these are only right for babies between 2.8 kgs to 6.8 kgs, so once the baby grows further, you won’t be able to continue using these. Furthermore, you will need to wash these at least 10 times before use to make sure the absorbance levels are high enough to last for a few hours. This is the only All-in-One option on the list, and one of the only good AIO types on the market, which makes it one of the most hassle-free diapers for babies over 4 months. The insert is sewed in, so it’s extremely convenient when you’re out and about and do not want to worry about whether you’ve put the inserts on properly. The absorbance levels are also quite high as it lasts for almost 3 hours for heavy wetters, and 6 hours otherwise, so you could even use it during the night if your baby is not a heavy wetter. Additionally, the inner fabric is really soft, so the baby won’t get rashes, and the outside layer is waterproof to prevent any possible leaks. If you’re looking for a pocket-type diaper that’ll work not only during the day but also at night, then this is the one for you. It comes with 2 inserts; you can use 1 for 4 hours, and 2 if you want to use the diaper for 8 hours. Therefore, during afternoon naps you can use just 1 insert, and during the night you can use 2. Even for heavy wetters, 2 inserts will hold for at least 5 hours, so you need not worry. The outer layer is waterproof, so you can take the baby out without thinking about possible leaks. 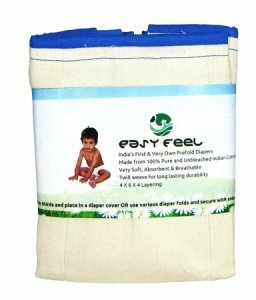 This diaper works best for infants over 5 kgs, and although the inserts take a while to dry, they’re really soft, so it’s worth it to use this diaper. 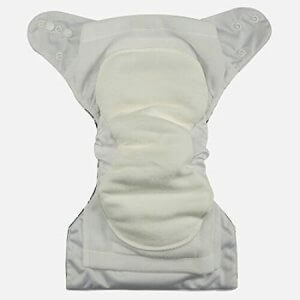 The best cloth diaper on the market, this pocket-type one is made of a really soft material, so it feels comfortable and doesn’t cause any rashes. It comes with 2 inserts, and 1 insert is good enough for the day, while 2 are better during the night. It holds up the longest as well, with 1 insert for almost 5 hours and 2 inserts for 10 hours. This is one of the rare diapers where the inner fabric dries really quickly, so it won’t make the baby feel uncomfortable. It is perfect for babies over 5 kgs, and aside from high absorbance levels, it is also leakproof, so you need not worry about any potential pee-accidents if you’re out in the town with the baby. People often encourage new parents to save money by using cloth diapers instead of disposable ones, but they rarely offer any useful alternatives. With the multitude of choices on the market, parents-to-be rarely have enough time to do intensive research and look for the one that’s most suitable for them. We hope our article was able to help such people, as well as others who wanted to learn about cloth diapers. We’ve given you all the important information about each type of cloth diaper, and also a list of the top 10 best cloth diapers on the market, so we hope you’ve been able to find the right one for you!